Oh no, the dreaded cone! I'm afraid there are some sad days ahead for poor Louie and probably even harder for you and Bryan having to look at those sad puppy dog eyes begging to take the darn thing off. Hope he gets better soon! Poor little sweet pea. I'm sending a kiss to his dog head. Poor little Louie! How is he adjusting? I'm sure he'll get even more attention than usual from his admirers at Starbucks, and I know you and Bry will give him extra TLC. I wonder how his friends at the park (both human and doggie-types) will react. I think he's playing us with the sad bit. 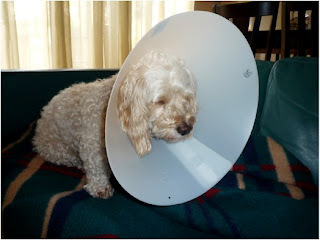 By not using the outdoor facilities with the cone, he forced us to remove it for his walks. I think we should have his IQ test,... he's got to be a candidate for Mensa! Louie, Louie, Louie what have then done to you. Hang in there old boy, I'll be back in a couple of weeks.